Beautiful cut! Thanks for sharing! Gorgeous snowflake! New follower and FB fan! What a clever card - love the rich colors - I just became a fan.........nice hopping with you......from one Pam to another! Great card! I am a new follower on both your blog and facebook page! Beautiful card!! love the CAS look! Lovely card! I always like seeing what everyone is cutting out with their various machines. I own 3 Cricuts so I won't be switching anytime soon! Nice card!! LOVE the snowflake!!! Great card, so elegant and easy to do! Am I getting confused? I believe I already commenTed that your card was elegant! Cool card. Just right to help feel the chill instead of the heat. I am a follower of your blog and subscriber. Very nice card. 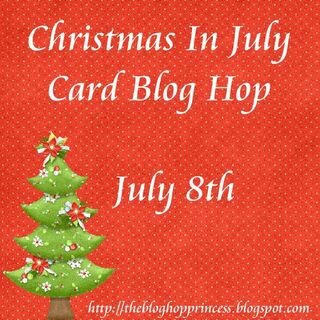 I love hopping along and seeing Christmas projects. Great card! Love the snowflake and that you chose to handwrite, "Merry Christmas". Your card is adorable. I love the shape of it and the way you cut that snowflake. Thanks so much for sharing. Very cute card! Love the snowflake. I'm a new follower!! Love the snowflake...it is so cool...Thanks for sharing. i liked your face book page and left a comment, also a follower here. Love this card. Love the snowflake. Thank you for being in the hop. I love blog hops and I love seeing new things! I never ever thought to make a die cut bottom like the card you have made. How exciting, I wanna go try! Thank you for the ideas, and the extra chance at a giveaway! Love the card and the choice of colors! Very regal! Thanks for the hop and for the chance to win blog candy! Wow, I REALLY love your card! It reminds me of a snowy winter's night. One of these days I might "graduate" to a Silhouette too! It looks like you can do SO MANY fun things with them. Love the snowflake designs; great color choices. What a great card. Love the dark backgound. And OMGosh, that snowflake is perfect! Cute card and I love that snowflake! !